Severe storms will drench a swath of the country from Texas to Mississippi over the next five days, according to the U.S. Storm Prediction Center. Through Thursday, 369 tornadoes have been reported across the country, the most in five years and more than double the normal number of sightings. An active jet stream and unusually balmy weather are to blame for the burst of deadly tornado activity, the storm prediction center said. Strong winds have dragged storms into the warm, humid air that’s blanketed the eastern half of the nation, creating conditions ripe for a weather phenomenon that leads to at least $400 million in damage a year in the U.S. The atmospheric moisture across the southern U.S. in January was more typical of April, Marsh said. A confirmed tornado touched down in central Massachusetts in February, a first, while there was still snow on the ground. The peak of tornado season varies across the country. 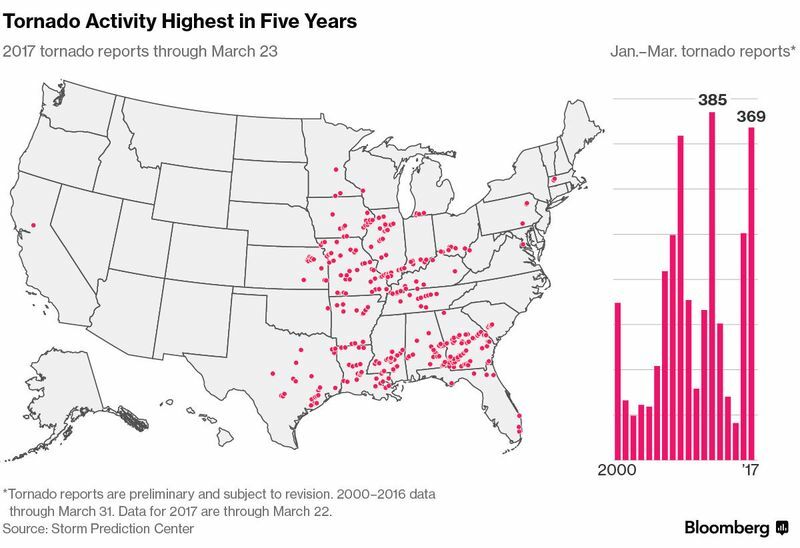 Activity is concentrated in the Southeast early in the year, drifting into the Great Plains’ “Tornado Alley” in May and June before heading into the Northeast by early summer. The U.S. has more tornadoes than any other country, according to a report by Lloyd’s of London. The nation averages about 1,200 tornadoes a year, with the storms killing as many as 60 people and injuring 1,500, Lloyd’s said. Tornado “outbreaks,” or storm systems that spin out multiple funnels in a limited time and area, are becoming more frequent in the U.S., according to study published in the journal Science in December. Still, the trend isn’t consistent from what some models predicted would result from global warming, the study found. This could mean climate change isn’t having an impact on tornado numbers, or it may be because scientists just haven’t figured out what effect it’s having, lead author Michael Tippett, a senior research scientist at Columbia University’s International Research Institute for Climate and Society in Palisades, New York, said in the report. One thing’s for certain: Costs associated with tornado damages are rising as the number of people living in the path of twister-producing storms rises. “Since 1980, losses due to severe thunderstorm events in the U.S., which includes tornadoes, hail and straight-line winds, have increased dramatically largely due to socioeconomic effects,” Mark Bove, a senior research meteorologist for Munich Reinsurance America Inc, said in an email. The system pushing into the central U.S. may create more severe weather as it pushes east, said Bob Oravec, senior branch forecaster with the Weather Prediction Center in College Park, Maryland. “It definitely is going to have the potential for a multi-day event,” Oravec said. And it could just be the first of several such systems, he said. Long-range models show the potential for a train of storms through the central U.S. for the next few weeks.